When water is scarce and rationed to the last drop, the ability to sense and manipulate water is to wield power. Granthon, the Cloudmaster, is dying, and there’s no stormlord to take over the responsibility of summoning water out of the sea, forming them into clouds, and directing the rain to fall where it’s needed. In an effort to avert an ecological and political disaster, he sends his most powerful rainlords to scour the land for any children with water sensitivity. Their search brings together forces that will change the land forever. Shale, a dirty, uneducated Gibber boy who displays remarkable water talent may be their best hope for survival. Terelle, a runaway girl, discovers a talent that not even the rainlords understand, but which can alter their destiny. The changing political climate—brought on by increasing water shortages and the lack of a leader with both political and stormlord powers—means that friends aren’t always allies, and alliances can’t always be trusted. To reveal more of the plot would do The Last Stormlord a disservice. It’s not that I want to be deliberately mysterious, but it would require too much explanation of this beautifully rendered world that is best saved for the actual reading. Although the book isn’t set in Australia, Glenda Larke is Australian, and I felt a kinship with her way of describing the land. The red dust, the blazing sun, the looming drought, and the tightening of water restrictions—these are all part of the Australian climate. I love the idea that water is so scarce its distribution can create huge political turmoil. The Cloudmaster must make tough choices on which communities to save when there’s not enough water to go around. Inevitably, these decisions favour the wealthy and the powerful, generating resentment among neighbouring communities, driving some, like the Reduners, to risk returning to the Time of Random Rain. Larke imbues the story with this awareness of the value of water. There’s no worse insult than to be called a water waster. (Is that the equivalent of oxygen thief, I wonder?) Social classes are defined by water allocations, and those born without allocations are treated with contempt and must survive by finding an employer who will provide them with water. Death rituals are concerned with extracting water from the dead. Even killing can be done “in the rainlord manner”. The Last Stormlord includes several love stories, but don’t expect happy endings. In typical fantasy novel style, most of the pairings come to an uncertain—or worse—end. Despite the superbly botched and highly amusing marriage proposal in chapter 4, the romances are very understated. I wish there had been a lot more, but at the same time I can’t see where Larke could’ve possibly fit them in given how much happens in this book. Some relationships are interesting because of their ambiguity. In a world where stormlords are in short supply, anyone with water sensitivity is under pressure not only to produce offspring, but to do so with a water-talented mate. Beyond the love stories, Larke calibrates conflicts and tensions between characters remarkably well and with subtlety. Very few characters are evil in an unhinged way—rather, they’re motivated by personal desires for power or fear or justice. This, too, is typical fantasy fare, but it’s executed well. I’m not one to linger over details of world building at the best of times, but at some point the story became so exciting that I found myself hurrying through descriptions of the land, or explanations of the sociopolitical structures, and most especially the religious beliefs and folklore behind the ability to control water. I’m sure I’ll regret this when the next book comes out. Having said that, the structure of the story, particularly the first part, is distracting. The story opens with Terelle, who doesn’t feature that much in the overall plot thus far, and not until the last third of the book. The first part of the book is engaging, yes, but because the author moves between at least 3 completely different settings, I felt yanked out of the story at each transition. I remember stopping every chapter or so to wonder whatever happened to Terelle. Rather than ordering the scenes chronologically, I would have preferred to focus on each main character and build their story more thoroughly in the first part of the book. Larke’s characters aren’t always predictable—I can say this even though I read the back of the book first. There are more predictable characters, but Larke keeps them interesting by putting them in situations that challenge their view of the world. Even knowing how the story ends, I wasn’t convinced who was good and who was bad until it was spelled out for me. Readers more well-versed in the genre may disagree. I would’ve liked to have seen a lot more of Shale’s training, and the origin of water magic. I hope these will be fleshed out in subsequent books. I love descriptions of magic in my fantasy books and Larke doesn’t indulge me nearly enough. I should mention that the story contains some violence. It’s not as bad as, say, Raymond E. Feist’s Serpentwar Saga, but it’s only the first book. 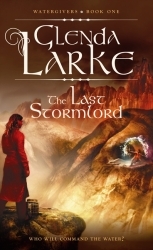 The uniqueness of the world that Larke creates is more than enough reason to read The Last Stormlord. Coupled with excellent writing and a compelling plot, this book has been a wonderful introduction to a new-to-me author. I’m definitely putting this series on my autobuy list. And if you’re still not convinced, the book is available, in its entirety, free online for a limited time. This review is based on an Uncorrected Proof generously provided by the publisher. The Last Stormlord was released in Australia this month by Voyager. The next book in the Watergivers trilogy, Stormlord Rising, is due for release in March 2010. In the US and UK, The Last Stormlord will be published by Orbit in March 2010 as part of the Stormlord trilogy. 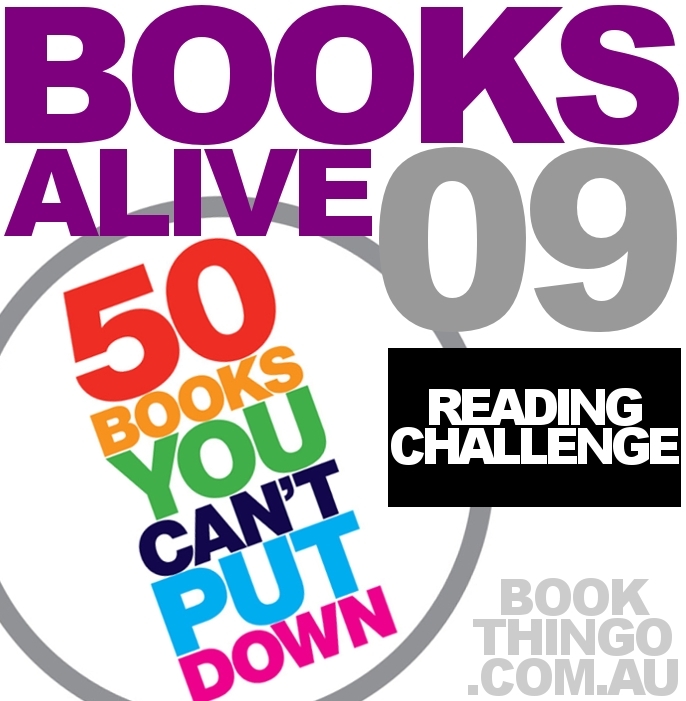 Tagged 2009 releases, australian authors, fantasy, glenda larke, harper collins, stormlord, voyager, watergivers. Nice review Kat – I’m going to mark this one for my dear one …. a huge fantasy/scifi fan. I just started this, and so far I like the world building a lot. I’ll be getting back to it after a scheduled detour for a couple of books that just arrived. Excellent review. I’m not a huge fantasy reader but this sounds interesting. Michelle, have you read CL Wilson’s Tairen Soul series? Lots of romance in that one, but the fantasy aspect is also well done. SonomaLass, let me know what you think of the book when you finish it. SarahT, thanks. The book is available online for a short time, so it’s a great way to try it. I love when publishers make first books in series freely available as ebooks. I think it helps the best novels grow an audience.